The summer is rolling on and we’ve gotta catch all the podcastémon! This ep of your fave Arts Interview podcast features Alexis Hillyard of the youtube show Stump Kitchen and comedian Ben Proulx. We talk professional joke touring, making vegan food with one hand, today’s biggest news stories and we don’t let Ben talk about being in The Revenant. Chris W. Cook doesn’t say much until we start talking politics and Mari Chartier lays out the Arts News which is especially #theatremari focused. All this and more in our latest ep so get it in those ear holes on the side of your face! Grab a warm cup of cocoa or whatever it is you drink and toss this Christmas comfort in your ear holes. Visit Big Winter Cabin Studios with the What It Is crew and their holiday-time friends Simon, Leif and Ellen! Plus, your total bro CTT wants to takes on hateful rhetoric, Mari makes up for lost time, Simon dishes on his comedy-tour and Taylor makes the guests play a game – all underscored by an amazing musician. The Christmas joy meter is set to 10 – and all we need is for you to listen up! Merry Christmas, everyone! An episode filled with guests and word slips. This week meet the improv dudes from POWERCUB and the cast/crew behind Edmonton Actors Theatre’s new show Burning Bluebeard. 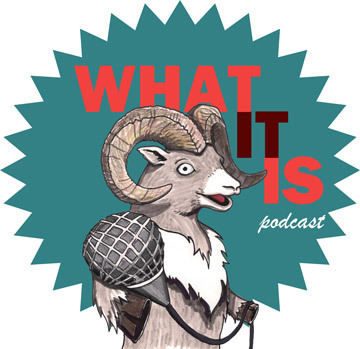 Hear about the What It Is guys’ improv heroes, a discussion about theatre fires and finding the light in the darkness through theatrical performance. Plus, Chris struggles to fill the shoes of #theatremari. It’s winter in Edmonton – perfect time to toss our new ep in your ear holes while hiding in your home. It’s the first episode of our newly announced fourth season! Get the long winded lowdown on why the guys from WII decided to call this ep their Season Premiere and meet their new pal comedian Dan Clarke. Plus, best friends of the show Success 5000 drop by to share some music and join in the conversation. Things get silly with the reboot of an old game (that actually works! ), Dan talks about his first stand up show in a basement and Success 5000 will eat EVERYTHING! Plus, Cook delivers the Arts News with gusto. Don’t waste time – get this ep inserted in those ear holes. The godfather’s of Edmonton podcasting drop by office studios to chat up Taylor about why they started their internationally famous podcast. The crew also discusses why bad movies are awesome, how to pick a movie to watch in today’s Netflix age and #theatremari shares an awesome story about her run ins with Edmonton city council and the Edmonton media-scrum. Get it in your heary holes!